Once upon a time, the princess of the Dragon King decided to sneak out of the palace in disguised as a 3 legged toad. She left the Dragon Lake and hopped along the stream, in the wood a large python was thinking a toad would make a good lunch. Luckily this was spotted by the young Liu Hau who was collecting logs for fire, Liu rescued the toad just as the python was about to make his attack. The princes was moved and left him a magic dragon pearl. After returning to the palace, the princess found herself in love with Liu so she sneaked out as a toad to look for him. One day, Liu came by the Dragon Lake for a drink of water and saw a string of coins, he looked around for the person who have left it behind but there were no one around, though poor Liu didnt keep it for himself. As he started to head home, the string of coins started to ring. Little did he know that the princess toad was holding the other end of the string in the lake, she was hoping to attract his attention with the coins. 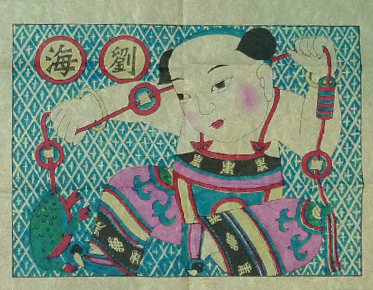 While he was examining the ringing coins, the python had returned to make his revenge and attack Liu from behind, out of desperation the toad thrown herself in between the two to protect Liu. With the distraction, Liu managed to picked up the axe he used for chopping woods and split the python in half. He was grateful for the little toad and started to play with it with string of coins, Liu said, “it would be great if you are a young girl, then we can get married and play together all the time.”. The toad hopped behind him, Liu felt the string got a stronger pull, turning around he found a beautiful girl standing behind him. Liu was shocked, “where is my little toad and who are you?” The girl told her the whole story and Liu was moved and the two lived happily ever after. 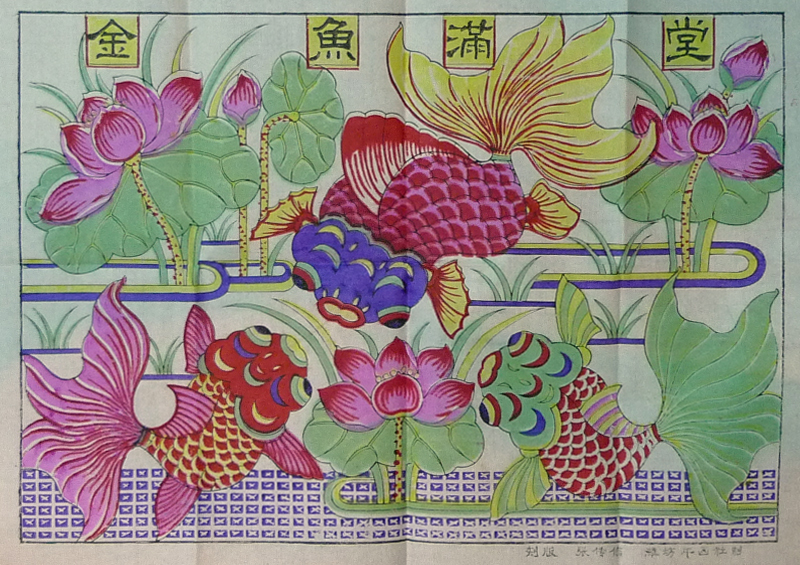 The title for this wood block entitled, A Tank Full of Gold Fish, 金魚滿堂 (jin yu man tang). Though gold fish is a popular pet for the Chinese, the blessing behind the cute gold fish is a play with homophone. The words 金玉滿堂 also share the same pronunciation but instead of gold fish, the large space is filled with gold and jade. It seems tremendously greedy to wish for a room to be filled with money, but throughout history China has been war, famine and hardship, a wish portrayed in the form of cheerful gold fish is for some the only thing that keep them going and maybe one day, they will have their living room filled with gold and jade. 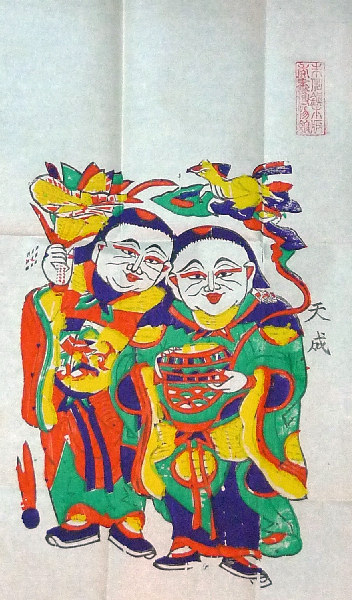 The two figures in this wood block print is the poet monks Han Shan and Shi Di. Han Shan and Shi Di are close friends, sharing ideas on poetry, zen teaching as well as literature. The 2 are known as the He He saints – for love, peace and harmony. Shi Di (left) carried a stem of lotus “荷 – He” while Han Shan (right) has a rounded box “盒 – He”. The words 荷盒 “He He” has the same pronunciation as the words 和合 “He He” which has the meaning peaceful harmony. At the wedding night, offering will be made by the bride and groom to the He He immortals for love, peace and harmony to be extended to the new family. The worship of the heaven and earth is perhaps the most primitive of all faith. Heaven and earth included all the natural and fundamental elements such as the sun, moon and the galaxy, mountain, valley, river, lake and the sea, wind, rain, thunder and lighting are all part of the believes. The power of nature poses both blessing and treats to the human world. All, these elements are humanized into a saint known as the God of Heaven and Earth. 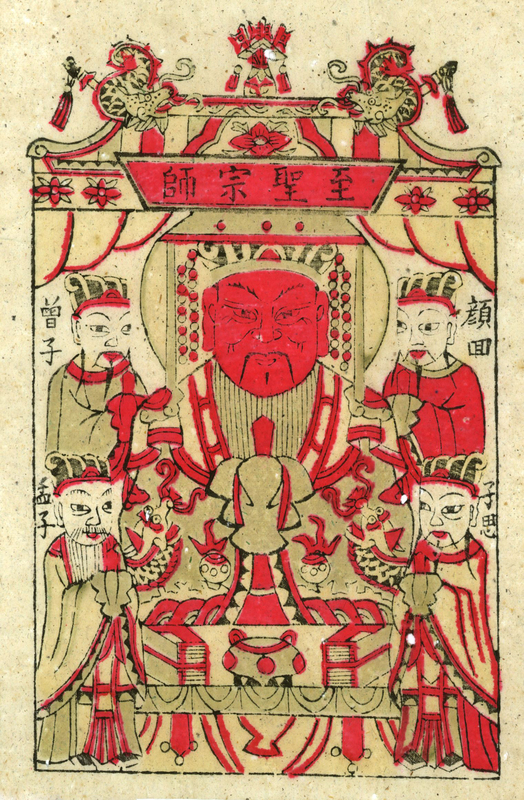 Unlike the other saints, he is not housed in a temple as he symbolizes the universe as such; on Chinese New Year day, a wood block print of him will be posted up under the eaves for worship. Other time you will come across the God of Heaven and Earth are in traditional Chinese weddings, the bride and the groom will begin their wedding ritual by worshiping this god of the universe. Below the Jade Emperor in the middle of this wood block print is an image of a tablet where it is written, “天地三界 十方萬靈”, there are 3 dimensions, the heaven, the earth and the dead, saints are every where. A phrase of blessing, 福壽無疆 “Fu Shou Wu Jiang”, good fortune and longevity without limit. On the print are 4 fruits (from right to left); the Buddha’s hand fruit, the peach, large fruit and the pomegranate, they are also symbol of blessings. Buddha’s Hand Fruit 佛手 – the fortune hand 福手 as they share the same pronounciation “Fu Shou”. Longevity Peach 壽桃- the magical peaches that produce longevity. Large Fruit 碩果- the rare individual that made large achievements. Pomegranate 石榴 – the many seeds of the pomegranate symbolizes many sons. 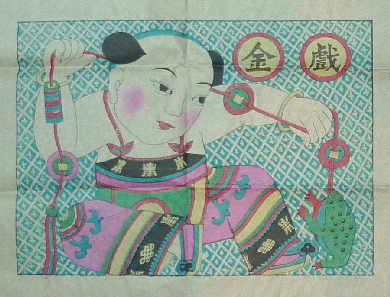 This new year print was from the Ping Yang school which started print making since the Sung dynasty. This print is by one of the famous print shop 興昌畫店 in Lin Fin Town. There are different new year print for different blessings, for fertility, longevity, health, prosperity, etc. 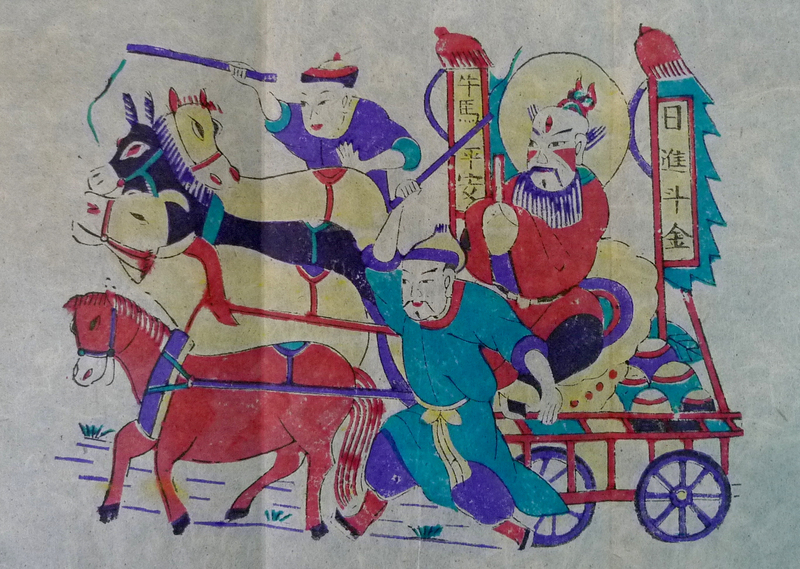 This particular one is for the livestock and the working cart; sitting in the middle the guy with 3 eyes is Hua Guang, one of the 4 Taoist Saints, a powerful warrior against evils. On both sides of him are 2 banners, 牛馬平安 (blessing to the ox and horses), 日進斗金 (daily income of 100g of gold). 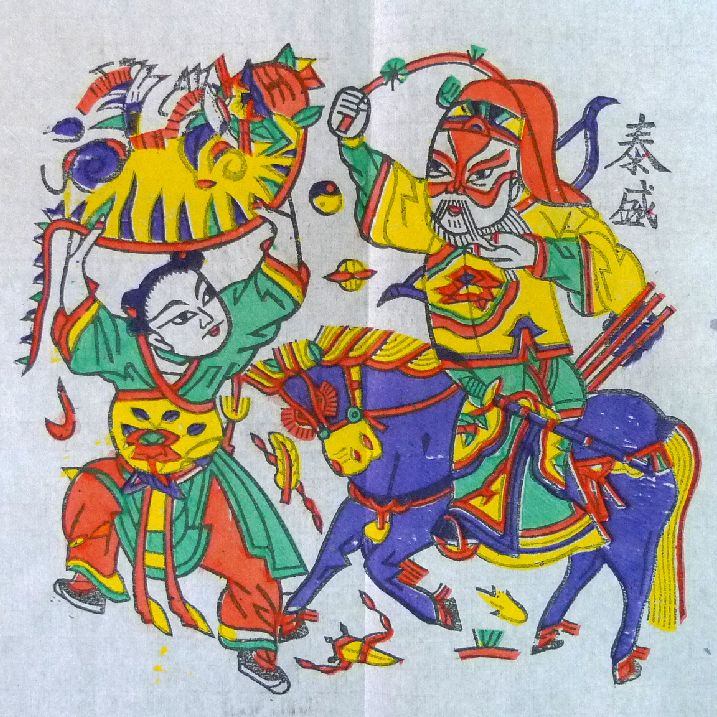 This is a Wei Fong school wood block print. The Wei Fong school of the Shan Dong province began in the late Ming dynasty and flourished in the Qing dynasty. Known for the bold composition and the reflection of life with humor. The wooden stencil of this print was carved by the artisan Zhao Lan Peng of the Wei Fong New Year Print Studio in the 80s. 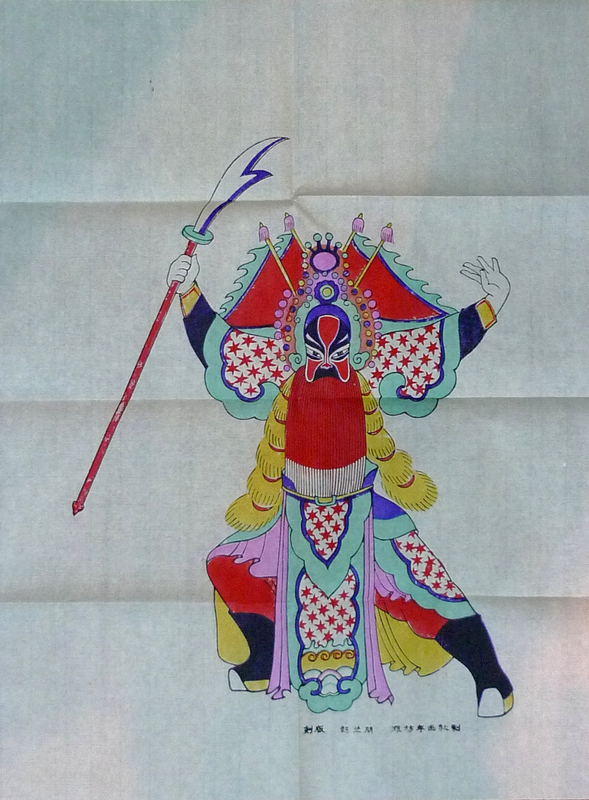 The subject of the print is Guan Yu, the red face general of the 3 Kingdom period. In the novel, “Romance of the Three Kingdoms”, General Guan took on loyal and fearless character which is worshipped by the police and the triads alike. This new year print is normally found in the village schools for the worship of Confucius. Confucius is sitting in the middle holding a gui, an element of statue. 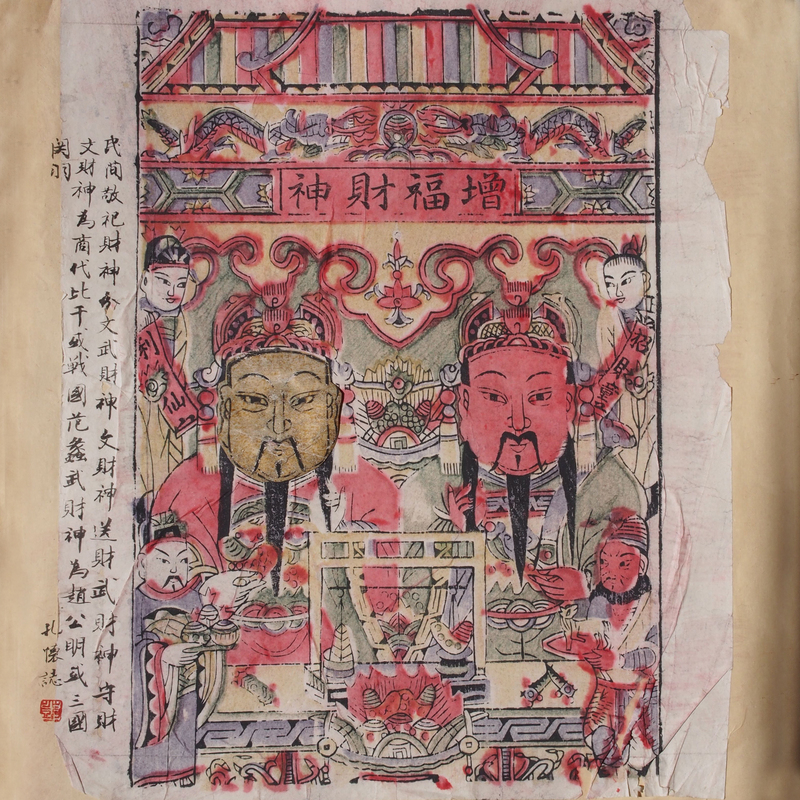 On the two sides are the 4 sages, notable Confuciusm figures; Yan Hui (顏回), Zi Si (子思), Zeng Zi (曾子) and Mencius (孟子). Apart from Mencius, the other 3 are the favorite student of Confucius. Mencius was born about 100 years after the death of Confucius and was a student of Confucius’s grandson. Mencius was expanding Confucius’s philosophy. 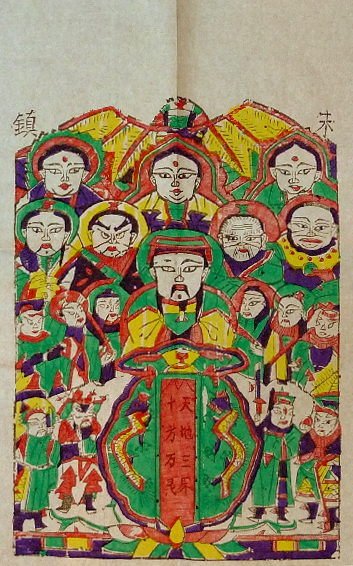 As in the wood block print, the 4 sages are normally seen along side with Confucius in the temples of Confucius.